Tucked amongst the mountain ranges deep in the heart of the Mesilla Valley lies the village of Hatch, New Mexico. This small town of just over 1,700 people enjoys the perfect climate for growing a true Southwestern foodie-favorite, the “Hatch Chile Pepper.” Along with food connoisseurs across Texas, we anxiously await Central Market's celebration of this flavorful pepper at their annual Hatch Chile Festival. Celebrated as the “Granddaddy” of all of Central Market's events 2012 marks their 17th annual hail to all things Hatch. The destination market's two-week long celebration has not only become a cultural event for the store's employees but also for the throngs of passionate pepper people who purchase the peppers by the caseload (say that three times fast). Pepper-phile or not its easy to get caught up in all the festivities and resultant recipes planned for this year's event running August 8th through August 21st. From Hatch-themed cooking classes and a company-wide cook-off to all nine locations chef's cases and shelves being lined with pepper products - Central Market definitely knows how to turn up the heat. Set to purchase 250,000 chile peppers and trucking them in every day over the two week festival time, then purveying them in such a fun and energetic fashion has made Central Market the top retailer of Hatch Chile Peppers in the country. Every year Central Market sends representatives to Hatch on a pepper pilgrimage to explore the deep connection between people and their peppers. We take a look inside this pepper to see what makes it such a hot commodity from Southlake to San Antonio. In 1965, the state of New Mexico designated the Chile pepper as an official state vegetable. In scientific terms the Chile pepper is technically a fruit, from the same family as the tomato or eggplant but no matter what you call it, we Texans love our chilies. For more than a century, New Mexico State's College of Agriculture and Home Economics has been aiding farmers in developing new and improved pepper varieties and the New Mexico chile industry boasts countless varieties of green, red, jalapeno, cayenne, and paprika peppers that vary in pod size and heat. According to The Chile Pepper Institute (CPI) at New Mexico State University there really is no chile pepper variety named “Hatch,” instead the name is a tribute to the area where the chile peppers grow. Dr. Paul Bosland, a Regents professor of horticulture at New Mexico State University and popularly known as “The Chileman” described it perfectly, “If you grow an Anaheim Chile in Santa Maria, California, and another one in Hatch, New Mexico, they won't taste the same. There is something special about New Mexico's high altitude, warm days, cool nights, and intense light that gives ours a distinctive full chile flavor and nice tolerable heat.” As the Co-founder and Director of The Chile Pepper Institute, Dr. Bosland is recognized throughout the world as one of the leading experts on Capsicum AKA peppers. With twenty years of cultivating experience the non-profit Chile Pepper Institute is an international organization dedicated to research, education, and archiving information about anything and everything pepper related. Dr. Bosland said, “Our mission is to educate the world about the wonders of chile peppers.” The mission is definitely a success. In 2006 the “Guinness Book of Records” confirmed Bosland's discovery of the world's hottest chile pepper, the Bhut Jokolia, used to make the fiery “Holy Jokolia” sauce sold by the Institute. It's certainly no secret chiles have been used to add flavor and heat to recipes of all kinds but you may be surprised to learn the original evolution of “heat” in chile peppers was actually Mother Nature's solution to the fruit's predatory problems. Mammals no longer ate the fruit because they couldn't digest the “hot” seeds. Birds, on the other hand, can safely eat the fruit and then act as the perfect natural distributors of pepper seeds. In this way Mother Nature has given the chile pepper both a line of defense and a source of propagation. Chile peppers have a long history of use in folk medicine as a headache cure and have lately been found to have strong anti-bacterial qualities as well. Check out the label on your favorite muscle patch for that aching back and chances are high you'll see capsaicinoids, the chemical that makes chile peppers hot, as one of the ingredients. This versatile veggie is also used in hot teas and lozenges for the treatment of a sore throat. The color that is extracted from very red chile pepper pods, oleoresin, is used in everything from lipstick to processed meats so give a “thank you” to the pepper the next time you put your lipstick on. We even hang peppers outside our homes in long strings called “ristra” originally as a way for farmers to dry the peppers out the ristra is now said to bring a home good luck. If you've ever been in a restaurant with a friend and you're both enjoying the same dish you may be feeling the fire, gasping for breath, while your friend is happily chowing down. Our palates feel the heat in different measures so an objective scale to rate the “hotness” of a pepper was created in 1912 by a pharmacologist who was using capsaicin in a muscle salve and was trying to determine how much they needed to dilute the heat to the level they wanted. That pharmacologist, Wilbur L. Scoville, created the Scoville Scale by dissolving chile peppers in alcohol and then diluting the mixture with sugar water. The hotter the sample the greater amount of water was required to dilute it. For example, if 1,000 units of water are needed to dilute 1 unit of the alcohol sample the sample was said to have a potency of 1,000 Scoville Units. To this day Scoville Heat Units (SHU) remain the standard industry measurement and are celebrated each year by awarding “Scovies” to the fieriest foods. 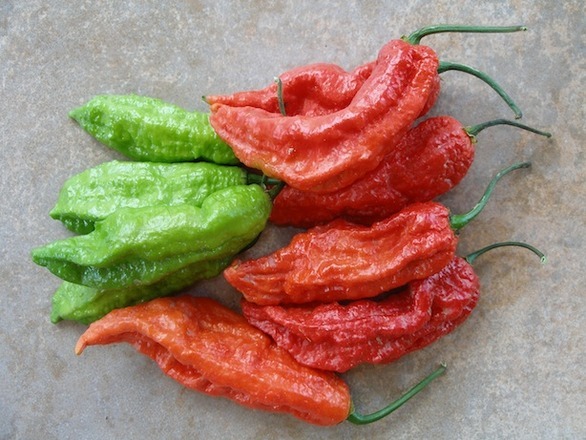 In fact, Bosland's Bhut Jokolia , the world's hottest pepper, has an SHU of 1,001,304 - now that's one hot pepper! As heat goes the Hatch Chile is relatively mild according to the Scoville Scale coming in at a range of 1,000 to 2,500 units, but according to Central Market, packed with a distinctly robust and earthy flavor not found in any other chile. A kind of magic occurs each August when Central Market lights up the fire under their pepper roasters and tosses the chiles in. It was 1995 when the Central Market location in Austin first started this salute to the seasonal return of the world-famous Hatch chile and every year since Hatch Heads look forward to the celebration. The Hatch Chile harvest only lasts a few weeks each year and Central Market takes full advantage of this short window of opportunity to bring more than 250,000 Hatch Chile peppers to their eight stores across Texas and our tables making them the largest retailer of Hatch Chiles in the country. This summer, our own Central Market in Southlake celebrates the 17th Annual Hatch Chile Festival beginning on August 8th and roasting along until August 21st with numerous events guaranteed to spice things up. When Central Market (CM) fires up their authentic, black chile roasters the mouth-watering scent will fill the air. The partners at Central Market all vie for a spot working behind the roasters and proudly wear the t-shirts designed each year with some partners sporting a collection of t-shirts and bandanas hailing the many years they've worked behind the roasters. Partners trade stories and fond memories of years past as they happily swelter in the Texas sun behind the roaring roasters. Roasting a chile pepper really brings out the flavors and while it might look like the peppers are burning, when the skin blisters and blackens the pepper is roasting just right. As a true Hatch Head will tell you where there's smoke rising from the CM roasters the chiles are being cooked to savory, smoked perfection. It all starts with a great way to get your Hatch fix going with a chile pepper app for your iPhone. The Central Market Hatch Chile Fest Pocket Cookbook app features a Hatch recipe database that includes a video showing ways for you to “heat up” your favorite recipes. You can even check out how to roast peppers on your own. Since the delicious peppers are available fresh only once a year roasting lets you store them in your freezer to use all year long. If cooking isn't your forte consider taking a Hatch Chile cooking class in the Central Market Cooking School. Your can check out available classes online and get signed up before all the chiles are gone. For those of us who love to swing into Central Market and pick up dinner for the family all ready to go the chefs at CM are hatching up some fantastic family meals like the Hatch Rotisserie Chicken, Hatch Meatloaf, Crab Cakes with Hatch and mouth-watering Hatch Burgers for your grilling pleasure. You can go by and visit the folks at the Deli/Cheese section where they offer roasted turkey breast with Hatch peppers and a Monterey Jack with Hatch peppers made exclusively for Central Market. Partners in the store, from the time you enter until the time you leave, await you with their special form of pepper power. If you are looking for a snack with a kick browse the shelves for the products that show up every year like the Organic Hatch green chile chips and the Hatch salsa. It's summer in Texas and there are two things you can count on. One, it's going to be hot and we Texans love our heat. Two, every year at this time you can once again enjoy the fanfare of festivities at Central Market celebrating the yearly harvest of the Hatch Chile. As the Chileman, Dr. Paul Bosland, says, “Chile peppers are like rock and roll, whether you like them or not, they're here to stay.” But remember, these New Mexico jewels are only harvested a few weeks a year so get ‘em while they're hot.